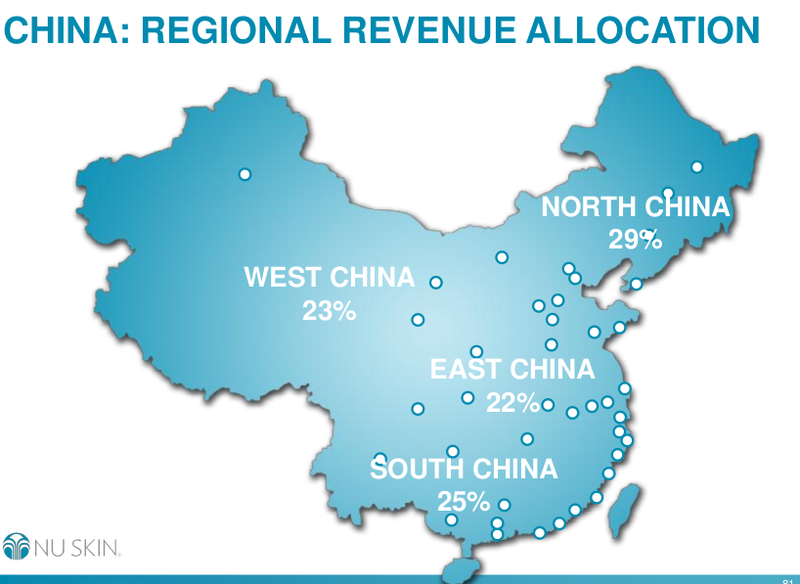 In the 2012 investor day Nu Skin published a map of their Chinese sales by region. Here is a map from Britannica of the population density of China. On these numbers the women (and maybe men) of Western China are giant consumers of the product relative to population - indeed probably relative to anywhere in the world. Nu Skin it seems has a knack of selling to Uyghur women. Perhaps they could explain it one day. Not to mention much of that western region is undergoing heavy unrest. I suppose if there's a riot/shooting/police crackdown every day, you gotta live a little and just look good? Your Uighur reference is probably inaccurate. Western China probably includes Chongqing and Sichuan, some of the most populous (Han dominated) areas in China. The numbers look off, but if they have for some reason hit it off in Sichuan it's not outside the realm of possibility. The % don't match to population density at first glance but the leap to assume the 23% is to goat herders is unwise, I think. This doesn't affect the rest of your thesis--I just think this data point is not convincing. I think Sichuan is classified as western (as opposed to southern) China. If you count Sichuan in Western China (using the definition of Western China as in the Wikipedia article) the population of Western China is still only about one 15th of China and that 1/15th of China does 23 percent of the volume. Also they have one factory (out of six) in the far Northwest. Its the only one of six we have not sent people to visit. I don't know how Nu Skin divides up China, but because of the population imbalances, it would also be quite normal to include Shaanxi and Chongqing in a 'western China' region. The numbers are not necessary abnormal and I doubt the slide in their presentation was drawn up by anybody who knows the first thing about Chinese demographics. Do they make skin whitening products by any chance? They use the lye for explosives? I still don't find this relevant or convincing. 23% of NuSkin's China volume is about $35mn in sales. Assuming $500 bucks a purchase by some of the princeling wives in Chengdu, that's 70k people who buy. There's 86 million people in Western China. So what, like .08% of the population has to buy NuSkin? Your post makes it sound like the entire goat herding population has to be in the NuSkin network for the math to add up. It doesn't and I think its misleading. Not a single Uighur has to be a member for this math to add up. Saying a company should have sales that match the population density of China when their business model so clearly depends on "nodes of influence" that will tend to group successful sellers together. I think you've found some pretty convincing cases on other companies, and the Nixon thing is interesting. In this case though your numbers don't support your case. In my opinion, it seems more like bending numbers to the thesis. I doubt most businesses map their sales regions to standard geographic boundaries, especially in countries that are half empty. Like China. Or Oz. Along the same lines, what is "West Europe" versus "North Europe," with similar sales, on slide 111 of their 2013 presentation? It's whatever they define them. Don't forget that Xinjiang is now nearly 50% Han Chinese and that these folks largely have the higher paying jobs across the board. I count up 289 million population in various provinces from this Wikipedia page for "Western China" (which includes places you might call mid-west or simply "central" but there is no central China). 20% of 1.3 billion is 260 million, a little over 20% of the population lives in "Western China" so a little over 20% of sales doesn't seem outlandish. Loads of Han Chinese have been moved to the West too, no need for goat-herders to buy product. The company gives a confusing graphic and should explain which provinces they mean. The western part of China is home to one-third of the country's administrative provinces and autonomous regions. It covers an area of 5.4 million square meters and has a combined population of over 280 million, making up 56 percent and 23 percent of the national total respectively. "If you count Sichuan in Western China (using the definition of Western China as in the Wikipedia article) the population of Western China is still only about one 15th"
Ok you saw that page too - just add up the number of people in each province in the list and see that it comes to 280 million or so, over 20% of China's popultion of 1.3 billion. Only including Sichuan and not the others ignores how the Chinese themselves define West China it seems.